Goodness knows that times flies when you are having fun scrambling to get school work finished and the local politicians call special meetings to vote on certain matters. I despise politics. ( Despise with all my being). I really just want to be left alone on this little farm to raise my kids and my food, BUT I did my part and showed up at that special meeting. So now I am sitting here at the table while the kids finish up math and I notice that my house is trashed. It might have something to do with seven kids and the coming and going, and I know that later today I will have to wipe down the counters and sweep the floor. But at this very moment I want to snack on chips and salsa and share with all of you my knock off buns. 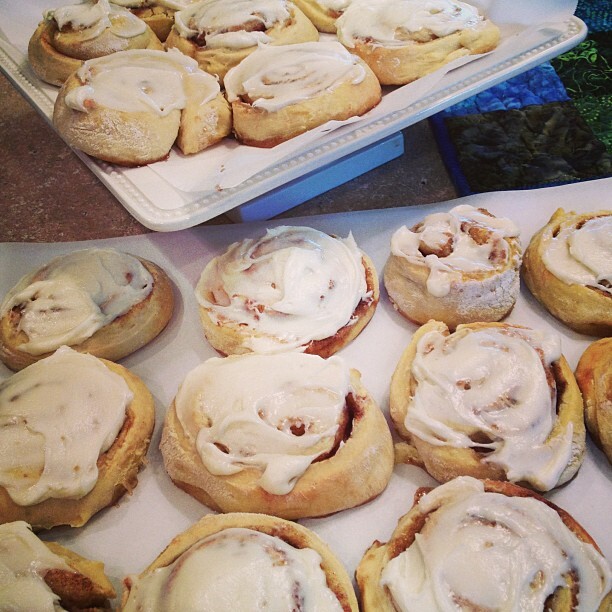 I speak of my recipe for cinnabons. My version of the incredibly super sweet, gotta have a cup of coffee to drink too because they are that rich cinnamon buns. I only bake them twice a year, and sadly I do not have pictures of the process. I think you all can manage though as these are made like any other cinnamon bun, except the dough has a special ingredient. I have gotten emails from several of you and for that I am grateful. Thank you for your comments, the glimpses into your own lives, and the patience for this recipe. *Combine these and knead until you have a soft dough that is not sticky or just slightly sticky. Using some extra flour sprinkled onto counter, roll dough out into a rectangle that is about 1/2 inch thick. *Roll dough up into a log and slice into 1 inch thick slices. Place on parchment lined baking sheet 2 inches apart. Bake at 350 for 15-20 minutes. Cool slightly and frost. Mix well and add more or less milk until desired consistency. Spread onto buns. Best eaten when they are still warm and with a cup of coffee. They were delicious! Thanks o so much for posting. For once I didn't have to double/triple a recipe for a dessert! Plenty for all.